Get ready to learn, laugh, and enjoy delicious food! All I need from you is a place to cook, a place to plug in a cord, and a group of people ready for a good time. * I’ll also need about 45 minutes before to set up the space and about 30 minutes after to clean up once the show is over. Please submit a Booking Request to get an estimate on pricing. Footage from a live cookin' demonstration at the 2018 Rock 'n' Ribsfest, July 4th, Union County Fairgrounds, Marysville, Ohio. Most people think delicious, falling-off-the-bone ribs takes hours of slow cooking in a smoker or oven, but imagine if you could have it ready in under one hour! Sound too good to be true?! Click here to see a list of previous clients and how I have served them. Please tell me where the demonstration will take place, if possible. What is the event? Why do you want a cooking demo? What would you like to see or learn? Be sure to view my client history linked above for ideas on what sort of show I can put together for you, although you should not feel obligated to select from that list. Please list any known food allergies for your group, if applicable. By submitting this request form, you are acknowledging that you have read and understand the information regarding the service being offered and the space requirements in order to fulfill your request. 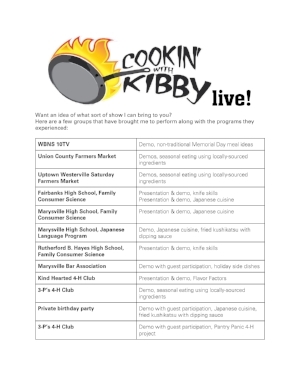 You are also acknowledging that this does not constitute a contract but is a request to obtain information from Cookin’ with Kibby regarding booking availability and pricing. * Space for the cooking demonstration may be indoors or outdoors. Space indoors must be no smaller than 300sf with access to external ventilation (either doors leading outside or windows that can be opened). Space outdoors must be no smaller than 300sf with measures in place to prevent strong winds. Outdoor demonstrations may be cancelled or postponed due to inclement weather at our discretion. Space indoors or outdoors must provide access to electricity within 10ft of the staging area from at least two (2) separate circuits. Overloading one circuit may disturb or prevent the demonstration. Space must be within 100’ of a clear parking area with access from the parking area to the space by rolling cart. Space must include seating for the number of attendants requested.